Cut leafy parts off cabbage leaves; discard or reserve for another use. Cut stems into 2-inch pieces. Heat oil in wok on high heat. Add mushrooms; stir-fry 2 min. or until lightly browned. 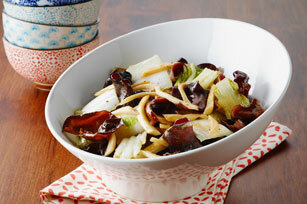 Add cabbage and wood ear; stir-fry 2 min. Add dressing and sugar; cook and stir on medium heat 1 min. or until heated through. A popular ingredient in Sichuan cooking, wood ear is also known as tree ear, Jew's ear or cloud ear mushroom. It gets its name from its flat ear-like shape. Wood ear is most commonly found in a dried form. To clean dried wood ear, soak it in warm water for 10 min. ; drain. Add more water; let soak 10 min. or until softened. The soaked wood ear will expand up to 5 times its original size. Rinse the soaked wood ear, then cut off and discard the tough root end before using as directed. Prepare using Kraft Calorie-Wise Balsamic Vinaigrette Dressing.